← Crenshaw, a “Harvey” for our time. One Plastic Bag, the Story of a Village and the Women Who Saved it. But something different is caught by the wind and catches her eye. It is silky. It will hold the fruit that fell when the palm leaf basket broke. It is a plastic bag. Before long, Isatou’s village is overrun with plastic bags. The garbage pile is unsightly and attracts bugs. It smells bad when burned. The village goats eat the bags, get sick and die. One Plastic Bag is the true story of Isatou Ceesay, a woman entrepreneur in Gambia who learns to crochet strips of the plastic bags into decorative purses. At first she and the other women crafters are made fun of, but soon the purses become popular and everyone wants one. The garbage pile begins to disappear. Goats no longer find bags to eat. 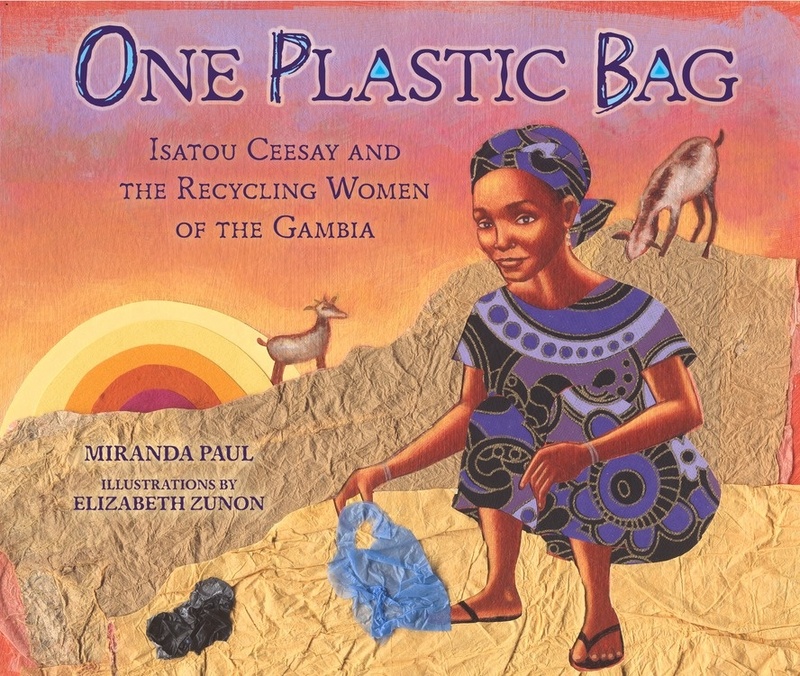 Miranda Paul visited Gambia several times and met the women who started the recycling project in their village. She was impressed with how the simple craft of making purses out of plastic bags contributed to the health of their village gardens and animals and increased the self-confidence of the people. Elizabeth Zunon’s collage illustrations are a burst of color, sure to catch the eye of the youngest reader. Older children will be fascinated by the courageous story of these women who went about in a very deliberative way to save their animals and improve their village. Paul’s poetic narrative makes this a pleasurable read for any adult—teacher or parent—looking for an important and engaging read-a-loud that also doubles as a visual treat.